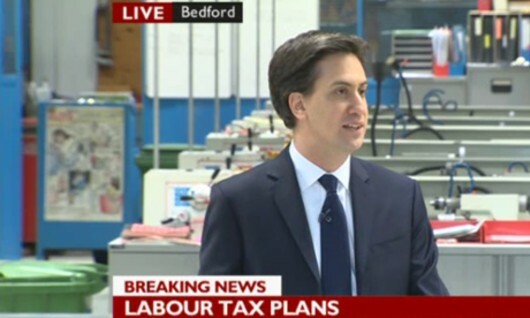 Labour’s tax revelation: Ed Miliband announces his plan to reinstate the 10p lower tax band, as broadcast by the BBC. 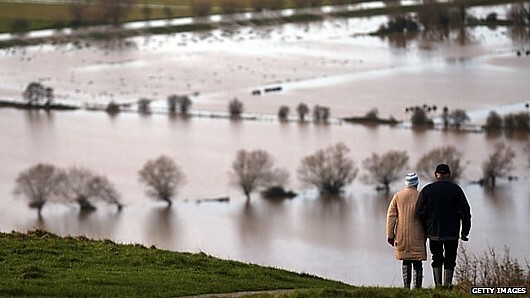 What’s David Cameron going to whinge about now? The comedy Prime Minister stuffed his foot deep into his own mouth during his questions on Wednesday, when he said he was not interested in Ed Miliband’s speech today because it would not contain any major policy messages. Instead, Miliband not only took away one of Cameron’s favourite crutches – he has loved attacking Labour for removing the 10p tax rate (which he knew perfectly well was only intended to be temporary at the time) – but also spirited away one of Nick Clegg’s policy plans: Reintroduce the 10p rate and use a tax on mansions worth more than £2 million to pay for it. That’s a brilliant strategy for the current situation. It answers Cameron’s criticism and it makes a clear message about Clegg – that Labour will do what he and his Liberal Democrats could not. And it creates a clear priority divide between Labour and the Conservatives, who will introduce in a tax cut for people in the highest tax band in April. Around 25 million people will benefit from this change, compared with 13,000 who will make money from the Tory tax plan. His comment that the recovery will be created by the many – not just the few at the top – meshes very well with the opinion put forward on this blog yesterday about the Bank of England’s optimistic view of the future of the economy. The bank’s view, put forward by Sir Mervyn King, was that an improved manufacturing sector would lift us up – but this would only improve matters for people at the top of the economic ladder; Miliband’s plan brings rewards to those at the bottom. And we know, don’t we, that people at the lower end of the pay scale keep the money circulating. That’s how the economy grows – keeping the money moving. •Break the stranglehold of the big six energy suppliers. •Stop the train company price rip-offs on the most popular routes. •Introduce new rules to stop unfair bank charges. •And cap interest on payday loans. And a policy on tuition fees is promised before the next election; Miliband says he can see how off-putting they are to people who would otherwise put themselves through university. These are all sensible measures. We pay too much for our energy; we pay too much on rail travel; the banks rip us off; and payday loans are nothing but a scam anyway – one that too many people are forced to use because the current system ensures they don’t earn enough to pay their way. In the Q&A session, Miliband said he would tax bankers’ bonuses to fund a work programme for unemployed young people – and he thinks businesses would back this. It’s a plan that might work, as the economic benefit from getting people back into work – the expansion that would result – could offset the losses the banks would suffer. So everyone could win. The urgent issue that hasn’t been covered today is that of disability benefits. Vox Political would like to see Labour change its approach to follow that outlined in the House of Lords this week: That the disability benefit system must be rethought, starting with the needs of disabled people, not with a plan for a budget cut. As matters stood at the start of the current government, only 0.4 per cent of disability benefit claimants were believed to be claiming fraudulently. That’s one in every 250 claimants – a very small amount. The current bid to clear as many people off the books as possible – no matter how ill they may be – is an abomination that cannot be allowed to pass. It seems David Cameron, campaigning in Eastleigh, has been asked for his opinion on the main announcement. He said it “looks like it has been cobbled together overnight”. Expect Labour’s poll ratings to enjoy a significant bounce.